Yesterday, I was reminded of some really important truths, and after I internalized them once again, I thought of my three daughters and the world they live in. Are you a parent? Do you ever get worried about your children? Are you surprised about what they encounter younger and younger? I want to help my children to have the tools that will be a guide for them as they navigate this complicated world we live in. I know that my children are not old enough to fully understand my words right now, but I know they will eventually need these truths because I need them right now. 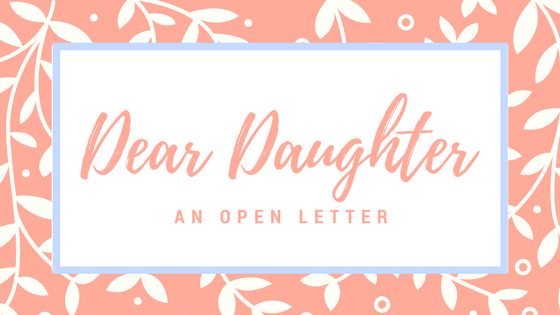 I hope this letter will remind you of some liberating and hopeful truths you know and inspire you to think about what you want to share with your own children. You know just what your children need; they were sent to you for a reason. I know that you also want your children to be healthy and happy! We can do it, even in this chaotic and loud world. There is nothing that can diminish your worth. You have value because you were born and you take space in this world. Never, ever forget that you can lose everything and still be of worth. A boy you like, your friends, your husband, your children, your job, your education, money, fame–no person or thing defines your worth. The sooner you internalize this truth, the more resilient you will be and the more confidence you will have to change the world in your unique way. For every good their is a bad. Joy is our purpose, but it is not a constant; hard times will come. Look for the good in life, but be aware that bad things can happen to good people. Don’t let this truth surprise you; you will become more compassionate and capable as you overcome your challenges and weaknesses. The trials will hurt, but you are never alone in the battle if you don’t want to be. Listen to the voice inside you that prompts you to do good and be good. Listen to your family because they love you. Listen more than you talk and you will learn. When you hear a lie, name it and throw it away from you. Be kind and serve others. You will not be able to please everyone and that is okay. But, you can offer others the kindness and mercy that you hope to receive. Remember, if you have worth, so does everyone you come in contact with…even the ones you don’t particularly like or agree with. The best way to find ways to be kind and serve is to stop thinking about yourself for a few minutes. You will be surprised at what you will see when you do. When you do good, there are rewards…maybe not always immediate, but there are promised blessings. Let this be a comfort to you and make choices that will result in positive consequences. This goes for relationships, possessions and accomplishments. Don’t be lazy and use your time wisely. I don’t want to look back and see years worth of time wasted. There is a lot of “stuff” to fill your time, but you will likely know what things are most important. Create beauty wherever you go. You have a mind capable of problem-solving and enhancing the world in small or large ways. Hold tight to and stand up for your beliefs; if you do this, you will be a leader because you will not change with every fleeting trend. Life as a woman is full of change. Change fosters growth so try to embrace your gender. The seasons of your life will take adjustment, but each stage can be great. This needs little explanation. You will simply understand as you grow into a woman. You cannot go wrong when you are motivated by real love. 5 Doth not behave itself unseemly, seeketh not her own, is not easily provoked, thinketh no evil; 6 Rejoiceth not in iniquity, but rejoiceth in the truth; 7 Beareth all things, believeth all things, hopeth all things, endureth all things. I know that having charity is a tall order, but striving for this will bring you lasting joy now and forever. I LOVE you, my daughters. You fill my life with joy and I am so excited to see your life unfold.